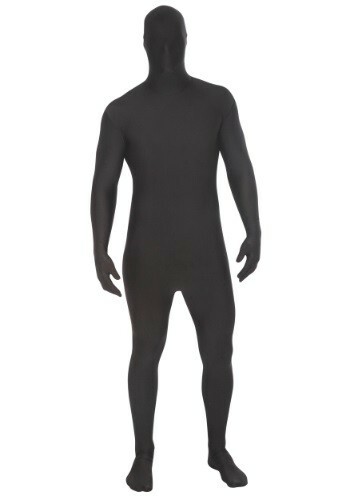 If you possess the vision and creativity of a true master dresser-upper, you can probably see that this Adult Black Morphsuit is the only costume you'll ever need. Because if you're flying solo, this skin-tight bodysuit will always let you claim that you're a shadow of your former self. And if you're with a group, the possibilities for optical illusion and mischievous mimicry are unlimited! But shadowplay is not your only option. This dark suit can be nudged towards the sinister or existential with a couple of spooky prop weapons or a name tag that simply says Nemo. Carefully-applied reflective tape or glow sticks can turn this stretchy, one-piece garment into the canvas for a lively stick figure or other simple shapes. Keep that in mind if you and your friends want to make your bodies the backdrop for a high-visibility message at any upcoming sporting events!